Five days of constant paddling in the Louisiana sun can be rewarding, full of surprises, and at moments a little maddening — especially for a first-time long-distance kayaker. That was me. 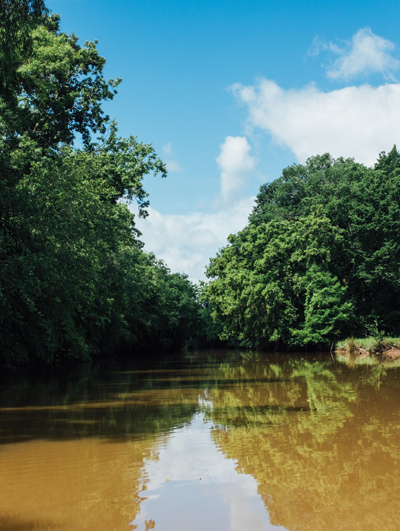 In May of 2016, I embarked on a journey down the Bayou Teche with my friend Jesse Guidry for part birthday celebration and part documentation of the waterway. Jesse, the birthday boy, is an avid paddler and has more than a few bucket list trips on his list, so I was happy to help him cross off this Bayou Teche journey. I, on the other hand, was limited to just a few floats looking for alligators in Lake Martin in my paddling history. Paddling the waterways of southwest Louisiana became my favorite hobby after this trip and inspired me to buy my first kayak. On a beautiful blue-skied morning, we loaded our crafts (heavy with supplies for any situation plus my camera gear) into the water at the Port Barre boat launch and set our course for Arnaudville, where we would spend our first night in a newly restored and updated 1890s Cajun/Creole cottage on the banks of the Teche. Beyond living in a piece of floating plastic in the middle of the bayou for days at a time, we weren’t exactly roughing it. We ate steak, drank good whiskey, found an unexpected boiled seafood joint, devoured the best fried catfish in Breaux Bridge, and never had to sleep outdoors. Every night we were able to find suitable accommod ations to rest our weary bodies. The wildlife, ever-changing landscape, and views that can only be experienced from the bayou made the five-to-10-hour days of paddling visually engaging (and helped take my mind off the need to be constantly paddling to make our daily destination before nightfall). As my skin browned in the mid-day sun, I could feel my arms, chest and shoulders strengthen from the rhythmic strokes that pulled my kayak forward in the still waters of the bayou. At times it felt as if we were in the middle of the Amazon jungle while at other stretches of our journey beautiful homes and backyard pig farms graced the horizon. The few people we did see along the river were happy to see the Teche being utilized and gave a friendly wave as we glided by. Countless pairs of cardinals (they mate for life) crossed our path, along with snakes, nutria rats, great blue herons, egrets and an alligator or two. We were even treated to a display of aquatic acrobatics by a group of guys with a fast boat and wakeboard. The final day of the trip and possibly the most rewarding, partially because it was the end and partially because of the magical giant cypress trees we paddled between on the edge of Lake Fausse Pointe, wasn’t part of our original plan. We left the Bayou Teche on a whim at Charenton to travel north into the Atchafalaya Basin Spillway, past Grand Avoille Cove and across the lake into Lake Fausee Pointe State Park. Right at the end, we caught a perfectly-timed spring shower to cool us after a full day of exploration. Thanks to those five days on the bayou I have a much greater appreciation for what the waterways of Acadiana have to offer. As you get out and explore this summer, hopefully you’ll find me in the shade of the cypress forest floating in my favorite piece of plastic. Port Barre to Arnaudville The Bayou Teche is narrow with lush forests on each bank for large stretches in this section of St. Landry Parish. It felt as if we were floating through the jungle with the tree limbs reaching out over the water to create a shaded tunnel heading south. We saw egrets feeding on snakes and frogs along the banks as we became acclimated to life on the water. The end of our first day was rewarded with a sno-ball at Wyble’s before retiring to the recently relocated and renovated Cajun Creole Cabin with a back porch overlooking the Teche. Arnaudville to St. Martinville The longest stretch of the trip was full of glimpses into backyard farms, a Little Blue Heron sighting, and a show of aquatic sportsmanship. We took a short break in downtown Breaux Bridge to refuel with crispy deep-fried seafood at Le Café. Cruising into our port for the night at dusk, we docked near the bridge in town and hauled our gear a few blocks to an old church that had been converted to a home. New Iberia to Charenton The water widens in this stretch of the bayou with both industry and neighborhoods increasing along the banks lined with elephant ear and cattail. On our lunch stop in Jeanerette we discovered the boiled crabs and shrimp at T-Bob’s Seafood. We also picked up a fried pork chop at The Coffee House, which serves up plate lunches rather than cold brew. Jeanerette is home to LeJeune’s Bakery that has been baking French bread and ginger cakes since 1884. Charenton to Lake Fausse The final day of the tour we paddled into the Charenton Drainage and Navigation Canal headed north across Grand Avoille Cove and into Lake Fausse Pointe State Park. The cypress forest on the edge of the lake was the most stunning natural wonder that we encountered in the five days on the water. Floating in awe among the centuries-old giant trees we spotted wildlife ranging from alligators to fishing osprey.